In today’s world the easiest way to stay connected with people. living far away is through the internet. Gone are those days when one had to write a letter, post it and wait in absolute oblivion for the reply mail to arrive. We have seen many amazing things happening after the internet became popular and accessible to common people. One of the amazing things that came as a gift to the people who love socializing was the social media platforms. Social media platforms have played a great role in recent years and could we have ever imagined that on the account of smartphone and social media, our lives would change so much. Nowadays, when we look around, people are always connected to each other through the internet and spending a word across the cities, states and even countries is not a big deal. With social media platforms, you can build your own world and you can invite and interact with others in that world. Whether you want to make friends online, chat with them, or share files, every possibility seems viable. WebSmyle is essentially a social media platform that is designed for people of all ages. Though one would require to be at least of a certain age to create a profile on WebSmyle, the features provided by the platform are distinct in all respect. If you want to chat online with friends, you will get a lot of platforms for that purpose but WebSmyle stands out due to other facilities. By opening a profile on WebSmyle you will get an array of features. What are the features of WebSmyle? 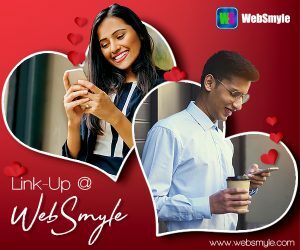 WebSmyle performs just like any other social media website providing all the necessary features that you would search for. The regular services range from making friends to chatting with new people, sharing files, and everything in between. The special features include online mobile recharge, astrological prediction, etc. ●Wallet – This is a great feature that allows WebSmyle profile holders a slew of benefits. The wallet feature can be used to store e-money and the balance can be .used for a lot of different purposes. On top of that, WebSmyle gives each individual free credits upon opening new profiles. ●Mobile Recharge – This is an amazing feature which proves to be really helpful when you are in urgent need to recharge your mobile. WebSmyle allows you to quickly recharge your phone without any hassle. You can utilize your wallet balance and recharge your mobile right away. ●Quiz – This is a great option if you want to kill time and gather knowledge at the same time. The social media platform has an interactive quiz feature that allows users to spend time by engaging into quiz programmes. ●Astrological Prediction – WebSmyle offers accurate astrological predictions for its users. The predictions are completely customized and verified by eminent astrologers. Learn how your coming days are going to be and act accordingly. Conclusion – You can avail all these features by opening a profile in WebSmyle. Among all the other establishes social media platforms, WebSmyle has quite efficiently made a place for itself. Wait no more, sign up today for free and start enjoying the unmissable benefits of the website.